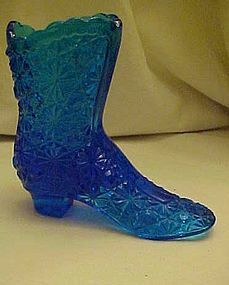 Lovely Colonial Blue Daisy & Button glass boot,handmade by Fenton c. 1967 - 1975. The Fenton logo not on the bottom so this dates this piece before 1970 when stickers were used .The boot measures about 4-1/2" long, 1-5/8" wide and is 4-1/4" high. This item is in very fine condition with NO chips or cracks. Not sure if these were intended for a dollhouse but they measure just 3 1/8: x 3 5/8" over all. 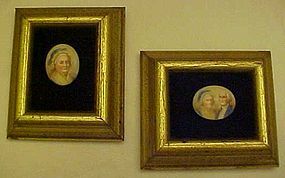 Oval porcelain portrait pictures of George and Martha Washington. Velvet backing with antiqued gold molded wood frames. They also have easel backs so you could stand them up if you wanted to. Nice condition, Sold as a pair. Lovely Tiger's Eye necklace set from Avon. 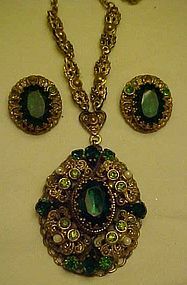 You get a 16" necklace with 3" extender and 1" pierced earrings. 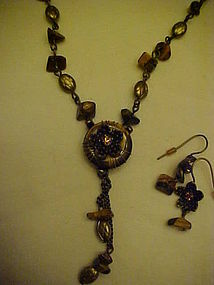 The necklace and earrings are brasstone with genuine tiger's eye chips. New, in box. 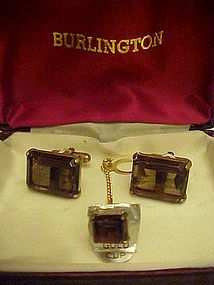 This set sold for $19.99 in the brochures in 2007! 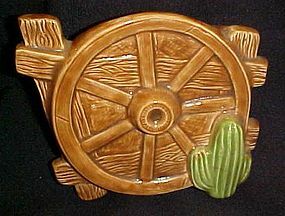 Vintage glazed ceramic wall pocket would go nicely with your cowboy, western, or southwestern decor. 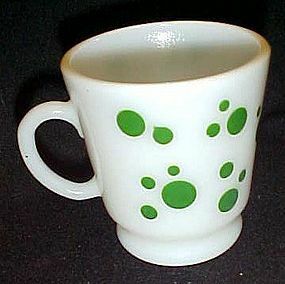 Measures 5 1/2" tall and 6 1/2" wide. Perfect condition with no chips or cracks. Hole in the back so it's easy to hang. Small AYR initials on the back. 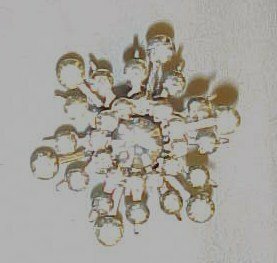 Pretty sparkling vintage rhinestone snowflake pin is perfect and brilliant. Measures 1 1/2" diameter. Paste set crystal clear stones in a silvertone setting. A perfect pin for your winter holiday wardroble. My apologies for the glare, this pin was hard to photograph. Unmarked. 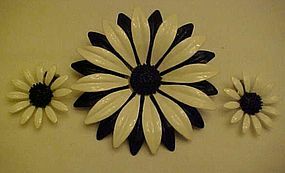 Pretty black and white enamel over metal large daisy flower pin with matching clip earrings. Center is realistic crushed glass under enamel, and shows a nice texture contrast against the smooth petals. Large pin measures just over 3" diameter. Earrings are 1 3/8" diameter. All three pieces are excellent with no rust, or chipping. A very striking set. No makers mark. 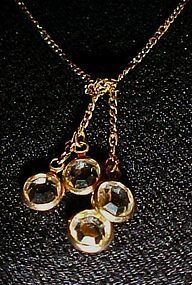 Pretty delicate gold tone chain with 4 dangle round crystals. Matching post back earrings. 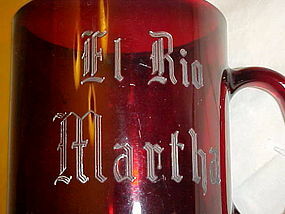 Set look like new and would make a nice gift. Necklace measures 9" long when closed. Perfect and shiny! 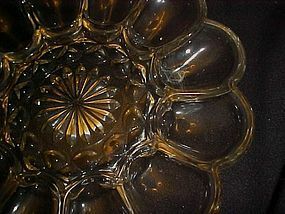 Pretty vintage crystal clear glass egg plate in the Fairfield pattern by Anchor Hocking. Plate can be used to hold deviled eggs or Easter eggs. Measures 10" in diameter and is in perfect condition. 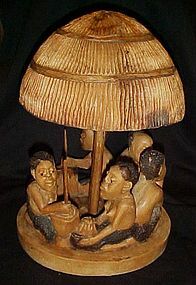 These are hand carved, and probably a souvenir from a tropical area. 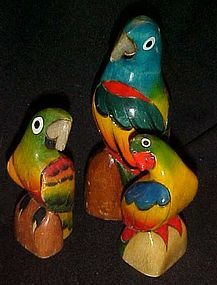 Three colorfully hand painted, hand carved parrots. Carved from a very lightweight wood. largest parrot measures 6" tall and the smaller ones are about 4". Great condition, and would be a nice gift for someone who loves birds. 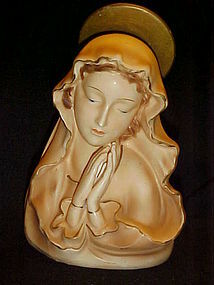 Beautiful vintage ceramic head vase planter is a beautiful Virgin Mary is hand painted is subtle brown tones with gold edge trim. Perfect condition and measures 7 2/4" tall. It has a paper Japan sticker, but not sure which company made her. 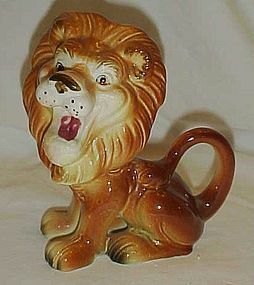 This little guy is roaring, but he doesnt look so convincing or intimidating with that cute face. He's somewhere between the cowardly lion and Leo the lion. Measures 5 3/8" tall, and has no chips or cracks. Japan bottom stamp. Vintage popular pattern of blue and white. Pattern was called many things by various companies, Blue onion, blue danube,cavalier & blue nordic,to name a few, but all are the same. Lamp is made of ceramic and measures 9.5" tall with the glass chimney on. 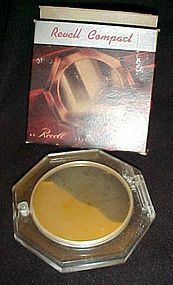 No chips or damages, and has original wick.